Ethereum's fork has gone as planned. A big upgrade for decentralized app platform Ethereum has gone as planned on Thursday. After a failed try in January, which was postponed just one day before the scheduled upgrade date due to a security issue, Ethereum has now been upgraded to a new version called Constantinople. Another, smaller upgrade called St. Petersburg, was rolled out as well to mitigate the security issue found in the original Constantinople code. Constantinople brings a number of improvements to Ethereum’s efficiency and speed (read a detailed overview here). But, most importantly, it paves the way for a major future upgrade called Casper. That upgrade, sometimes also called Ethereum 2.0, is scheduled to go live later this year and bring an immensely important switch from proof-of-work to proof-of-stake consensus mechanism, among other changes. St. Petersburg, which went live immediately after Constantinople, essentially undoes one of Constantinople’s upgrades, which was found to be a security risk. Major upgrades (also called hard forks) of blockchain-based systems such as Ethereum can be tricky as they require participants on the network to switch to new software. If they don’t, the fork becomes contentious — the blockchain splits in two with some users switching to the new version and some staying on the old one. Constantinople and St. Petersburg were activated at block height 7,280,000 or roughly at 8pm UTC on Thursday. More than 3,700 blocks were mined on Ethereum since then, and everything points to the fork going as planned. The price of Ethereum is slightly down in the last 24 hours according to CoinMarketCap, having fallen roughly 1% to $136.81. On Tuesday, Coinbase announced that XRP will be the latest cryptocurrency to hit its pro-level trading platform. Coinbase Pro will allow users to transfer XRP to the platform right away (“After 10am on February 25”) but there will be at least a 12-hour delay before trading is enabled. Support for XRP will be available for users in the U.S. (though not those in New York state), the U.K., Canada, Singapore, Australia and the EU. As one of the most controversial cryptocurrencies around, the addition of Ripple’s XRP is sure to stir up the institutional banking coin’s hot-blooded armies of supporters and detractors. The cryptocurrency has faced ongoing criticism for its centralized nature and its perceived lack of use beyond cross-border payments by financial institutions. “Once sufficient supply of XRP is established on the platform, trading on the XRP/USD, XRP/EUR, and XRP/BTC order books will start in phases, beginning with post-only mode and proceeding to full trading should our metrics for a healthy market be met,” the company said in its announcement. For now, XRP will be limited to Coinbase Pro, Coinbase’s feature-rich platform previously known as GDAX. The company declined to specify when XRP would hit the regular Coinbase platform, though in the past those additions have often followed Coinbase Pro by a few weeks. Last year, Coinbase began expanding its previously spartan coin offerings to include a much wider selection of offerings beyond its longtime support for Bitcoin, Litecoin, Ethereum and a small handful of other offerings derived from those core coins. XRP is the third largest cryptocurrency by market cap, trailing Bitcoin and Ethereum. In the world of blockchain, it is the sector of fintech where most think Satoshi’s invention will have the greatest impact. And in finance, there are few more elite worlds than those of asset management. So it’s of some significance that a two-year project to disrupt and open up this world using blockchain has now come to fruition. Last Friday in Zug — a small provincial Swiss town which has embraced crypto startups — the Melonport startup consciously chose to dissolve itself and release its Melon protocol on the world of asset management. It will now build its company on a blockchain protocol it doesn’t control. The precedence for this kind of move in the tech world are many. It’s not unheard for a startup to release an Open API and let other potential competitors build on it, while hoping they will be good enough to beat others. And Red Hat, long ago, built a huge company on top of the open-source Linux software. What is different here is that Melonport built the Melon Protocol on the Ethereum blockchain, but it will no longer have the majority say on how that protocol develops. No one will technically “own” the Melon Protocol, but the founders of Melonport have entrusted its development to an independent Melon Council, which will provide governance and direction as it develops. What was Melonport will now morph into a new company called Madeeba to build tools on top of its creation. Madeeba will hold one seat on the Melon Council. Fans of Stars Wars will have to forgive me, but it’s not unlike Obi-Wan Kenobi becoming stronger in “The Force” by allowing Darth Vader to kill him off. Augur is the only major crypto platform to do the same as Melonport: letting the community run the software. Augur has grown steadily too, showing this methodology can work. Blockchain technology has the potential to radically transform business and allow community owned networks. However, getting the governance right is key in this space. That’s why creating a system that prevents co-option and capture by vested interests is so important. Other blockchains, such as EOS, have been criticized for being in thrall to a limited number of nodes, for instance. The Melon Council DAO says this will allow decision making within the Melon Council to remain secure and transparent to the community. The members of the Melon Council will be able to vote on-chain on matters such as inviting new members into the Council, adjusting the amgu price, updating the Melon protocol.eth ENS subdomains and updating protocol parameters. The Melon Council will also be able to use Aragon tools to make their decisions about inflation spending transparent. “We’re doing this to show that we were serious about building a decentralized system. If we stuck around everyone would be relying on us to be the sole maintainer of the protocol, or they might suspect we have some kind of bigger influence,” El Isa continued. In the race toward decentralized asset management, there have been other attempts to create new vehicles, such as Iconomy and CoinBlock, but it’s fair to say none has been as successful or as long-lived as the Melonport project. Madeeba will now aim to build a user-friendly product, “so anyone could set up a fund and not even feel you’ve entered into the blockchain space,” says El Isa. A sea of hands (belonging to both traditional and non-traditional asset managers) went up in the room when people were asked if they would pilot both Madeeba and the protocol. The next time anyone sees a startup announce that it’s working on a “blockchain protocol to rule them all,” the next question to be asked should be: how will that protocol operate for others, and how will it be governed? Because governance has become one question, if not the key question, the brave new world of blockchain must answer. Bilgin Ibryam is a principal architect at Red Hat, committer and member of Apache Software Foundation. He is an open-source evangelist, blogger, occasional speaker and the author of Kubernetes Patterns and Camel Design Patterns. Here is one way to look at distributed ledger technologies (DLT) and blockchain in the context of integration evolution. Over the years, businesses and their systems are getting more integrated, forming industry-specific trustless networks, and blockchain technology is in the foundation of this evolutionary step. Large organizations have a large number of applications running in separate silos that need to share data and functionality in order to operate in a unified and consistent way. The process of linking such applications within a single organization, to enable sharing of data and business processes, is called enterprise application integration (EAI). Similarly, organizations also need to share data and functionality in a controlled way among themselves. They need to integrate and automate the key business processes that extend outside the walls of the organizations. The latter is an extension of EAI and achieved by exchanging structured messages using agreed upon message standards referred to as business-to-business (B2B) integration. Fundamentally, both terms refer to the process of integrating data and functionality that spans across multiple systems and sometimes parties. The systems and business processes in these organizations are evolving, and so is the technology enabling B2B unification. There isn’t a year when certain integration technologies became mainstream; they gradually evolved and built on top of each other. Rather than focusing on the specific technology and year, let’s try to observe the progression that happened over the decades and see why blockchain is the next technology iteration. Next we will explore briefly the main technological advances in each evolutionary step listed in the table above. Common database approach is used for system integration within organizations. File sharing method is used for within and cross-organization data exchange. With universal protocols such as FTP, file sharing allows exchange of application data running across machines and operating systems. But both approaches are non-real-time, batch-based integrations with limitations around scalability and reliability. Remote procedure call provides significant improvements over low-level socket-based integration by hiding networking and data marshaling complexity. But it is an early generation, language-dependent, point-to-point, client-server architecture. Object request broker architecture (with CORBA, DCOM, RMI implementations) introduces the broker component, which allows multiple applications in different languages to reuse the same infrastructure and talk to each other in a peer-to-peer fashion. In addition, the CORBA model has the notion of naming, security, concurrency, transactionality, registry and language-independent interface definition. Messaging introduces temporal decoupling between applications and ensures guaranteed asynchronous message delivery. So far we have seen many technology improvements, but they are primarily focused on system integration rather than application integration aspects. From batch to real-time data exchange, from point-to-point to peer-to-peer, from synchronous to asynchronous, these methods do not care or control what is the type of data they exchange, nor force or validate it. Still, this early generation integration infrastructure enabled B2B integrations by exchanging EDI-formatted data for example, but without any understanding of the data, nor the business process, it is part of. With CORBA, we have early attempts of interface definitions, and services that are useful for application integration. The main aspects of SOA that are relevant for our purpose are Web Services standards. XML providing language-independent format for exchange of data, SOAP providing common message format and WSDL providing an independent format for describing service interfaces, form the foundation of web services. These standards, combined with ESB and BPM implementations, made integrations focus on the business integration semantics, whereas the prior technologies were enabling system integration primarily. Web services allowed systems not to exchange data blindly, but to have machine readable contracts and interface definitions. Such contracts would allow a system to understand and validate the data (up to a degree) before interacting with the other system. I also include microservices architectural style here, as in its core, it builds and improves over SOA and ESBs. The primary evolution during this phase is around distributed system decomposition and transition from WS to REST-based interaction. In summary, this is the phase where, on top of common protocols, distributed systems also got common standards and contracts definitions. While exchanging data over common protocols and standards helps, the service contracts do not provide insight about the business processes hidden behind the contracts and running on remote systems. A request might be valid according to the contract, but invalid depending on the business processes’ current state. That is even more problematic when integration is not between two parties, as in the client-server model, but among multiple equally involved parties in a peer-to-peer model. Sometimes multiple parties are part of the same business process, which is owned by no one party but all parties. A prerequisite for a proper functioning of such a multi-party interaction is transparency of the common business process and its current state. All that makes the blockchain technology very attractive for implementing distributed business processes among multiple parties. This model extends the use of shared protocols and service contracts with shared business processes and contained state. With blockchain, all participating entities share the same business process in the form of smart contracts. But in order to validate the requests, process and come to the same conclusion, the business processes need also the same state, and that is achieved through the distributed ledger. Sharing all the past states of a smart contract is not a goal by itself, but a prerequisite of the shared business process runtime. Looked at from this angle, blockchain can be viewed as the next step in the integration evolution. As we will see below, blockchain networks act as a kind of distributed ESB and BPM machinery that are not contained within a single business entity, but spanning multiple organizations. 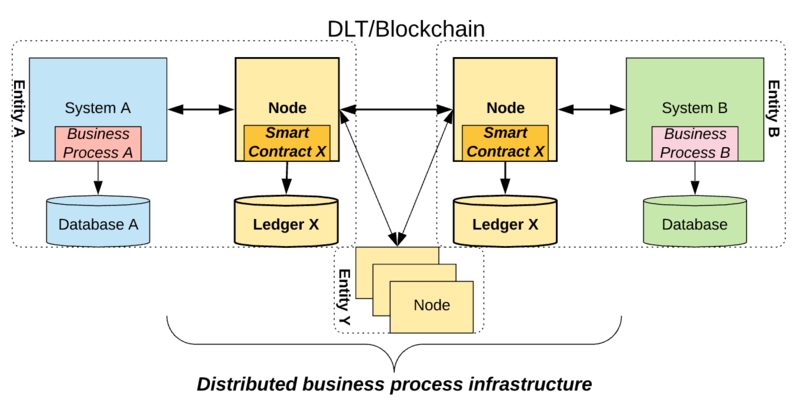 First the protocols (such as FTP), then the API contracts (WSDL, SOAP) and now the business processes themselves (smart contracts) and their data are moving outside of the organizations, into the common shared space, and become part of the integration infrastructure. In some respect, this trend is analogous to how cross-cutting responsibilities of microservices are moving from within services into the supporting platforms. With blockchain, common data models and now business processes are moving out of the organizations into the shared business networks. Something to note is that this move is not universally applicable and it is not likely to become a mainstream integration mechanism. Such a move is only possible when all participants in the network have the same understanding of data models and business processes; hence, it is applicable only in certain industries where the processes can be standardized, such as finance, supply chain, health care, etc. Having done some chronological technology progression follow-up, let’s have a more broad look at the B2B integration evolution and its main stages. 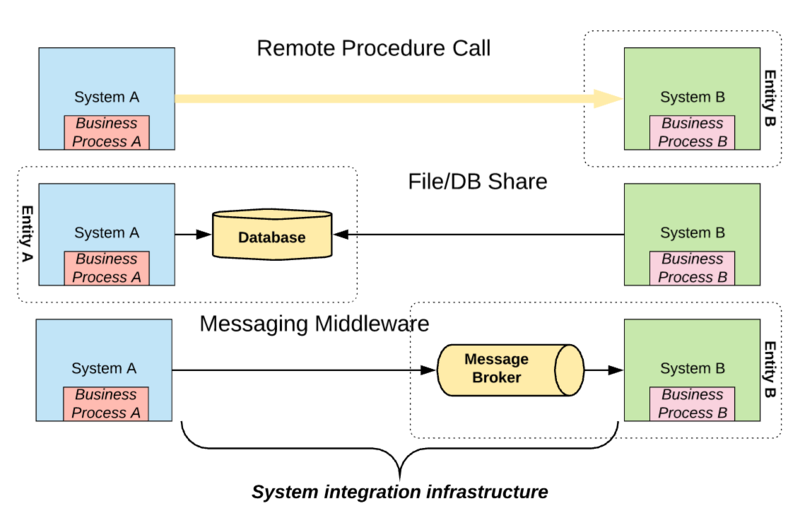 Integration model: client-server, where the server component is controlled by one party only; examples are databases, file servers, message brokers, etc. Explicit, shared infrastructure: low-level system protocols and APIs such as FTP. Implicit, not shared infrastructure: application contracts, data formats, business processes not part of the common integration infrastructure. Integration model: client-server model with APIs described by contracts. Explicit, shared infrastructure: protocols, application contracts, and API definitions. Implicit, not shared infrastructure: business processes and remote state are still private. 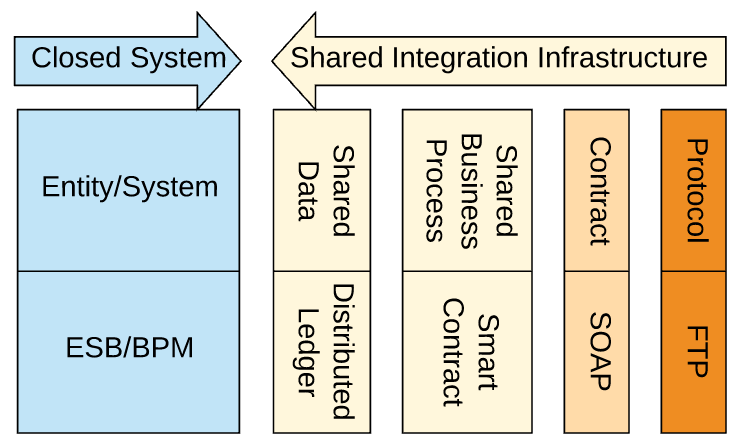 Integration model: multi-party, peer-to-peer integration, by forming business networks with distributed business processes. Explicit, shared infrastructure: business process and its required state. Implicit, not shared infrastructure: other non-process related state. Hyperledger Fabric is one of the most popular and advanced blockchain frameworks, initially developed by IBM, and now part of Linux Foundation. Hyperledger Sawtooth is another Linux Foundation distributed project developed initially by Intel. It is popular for its modularity and full component replaceability. Quorum is an enterprise-focused distribution of Ethereum. Corda is another project that builds on top of existing JVM-based middleware technologies and enables organizations to transact with contracts and exchange value. There are already many business networks built with the above projects, enabling network member organizations to integrate and interact with each other using this new integration model. In addition to these full-stack blockchain projects that provide network nodes, there also are hybrid approaches. For example, Unibright is a project that aims to connect internal business processes defined in familiar standards such as BPMN with existing blockchain networks by automatically generating smart contracts. The smart contracts can be generated for public or private blockchains, which can act as another integration pillar among organizations. Recently, there are many blockchain experiments in many fields of life. While public blockchains generate all the hype by promising to change the world, private and permissioned blockchains are promising less, but are advancing steadily. Enterprise integration has multiple nuances. Integration challenges within an organization, where all systems are controlled by one entity and participants have some degree of trust to each other, are mostly addressed by modern ESBs, BPMs and microservices architectures. But when it comes to multi-party B2B integration, there are additional challenges. These systems are controlled by multiple organizations, have no visibility of the business processes and do not trust each other. In these scenarios, we see organizations experimenting with a new breed of blockchain-based technology that relies not only on sharing of the protocols and contracts but sharing of the end-to-end business processes and state. And this trend is aligned with the general direction integration has been evolving over the years: from sharing the very minimum protocols, to sharing and exposing more and more in the form of contracts, APIs and now business processes. This shared integration infrastructure enables new transparent integration models where the previously private business processes are now jointly owned, agreed, built, maintained and standardized using the open-source collaboration model. This can motivate organizations to share business processes and form networks to benefit further from joint innovation, standardization and deeper integration in general. Mobile cryptocurrency wallet BRD is announcing that it has raised $15 million in Series B funding. The funding comes from SBI Crypto Investment, a subsidiary of Japanese financial services company SBI Holdings (formerly a subsidiary of SoftBank). BRD said the funding will allow it to grow its product and engineering teams, and to expand in Japan and across Asia. It’s surprising to see a crypto startup raising money now, given the broader crypto downturn. After all, BRD bills itself as the simplest way to start buying and storing cryptocurrencies — but does that mean anything if consumers are being scared away from investing? In fact, BRD says it doubled its total install base in 2018, ending the year with 1.8 million users globally. It also says it’s currently being used to store the equivalent of $6 billion mostly in Bitcoin and Ethereum — with a 24 percent increase in monthly active users between November and December, after it started accepting stablecoins (which are pegged to the value of a fiat currency). BRD has now raised a total of $55 million. It’s also announcing a partnership with Coinify, allowing users to make cryptocurrency purchases using bank accounts in the European market.